For over 20 years Sono-Tek has been supplying our ultrasonic fluxing nozzles to our OEM partners. When purchasing a new wave or selective solder machine current Sono-Tek customers and those new to Sono-Tek, are able to take advantage of our unique ultrasonic technology. Choosing the ultrasonic spray fluxing option when specifying in a solder machine, adds a higher level of quality, flexibility, control, and reliability to your through hole manufacturing process. For over 20 years Sono-Tek has been supplying our ultrasonic fluxing nozzles to our OEM wave solder fluxing partners. When purchasing a new wave or selective solder machine current Sono-Tek customers and those new to Sono-Tek, are able to take advantage of our unique ultrasonic technology. Choosing the ultrasonic spray fluxing option when specifying in a solder machine, adds a higher level of quality, flexibility, control, and reliability to your through hole manufacturing process. Sono-Tek works with the premier wave and selective solder machine manufacturing companies to engineer our ultrasonic fluxing technology into their spray fluxing platforms. 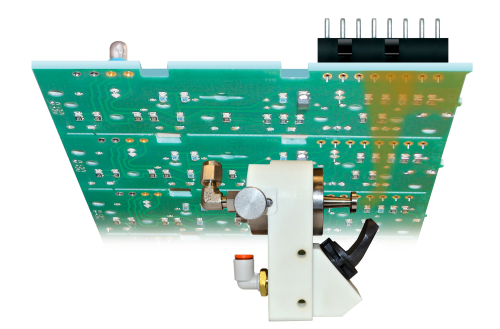 The result is a fully integrated enhancement that customers are able to use to improve their soldering process. Up to 70% reduction in flux consumption and VOC’s when compared to alternative spray fluxing technologies. Lower maintenance when compared to all other spray fluxers. Self-cleaning ultrasonic nozzle will not clog and has no moving parts. Small droplets result in excellent through hole penetration for maximum top-side fill. Compatible with ALL fluxes without clogging. Increase throughput compared to slow jetting technology. Vastly reduced overspray and satellite flux droplets. Highly repeatable and accurate spray. How Ultrasonic Nozzles Work"A Tale of Two Fluxes" article4,000 Fluxers in 40 Years! The premier Wave Solder and Selective Solder machine manufacturers of the world offer Sono-Tek Ultrasonic Spray Fluxer Technology. Contact these Sono-Tek partners to purchase your next new machine with integrated ultrasonic fluxing capability.